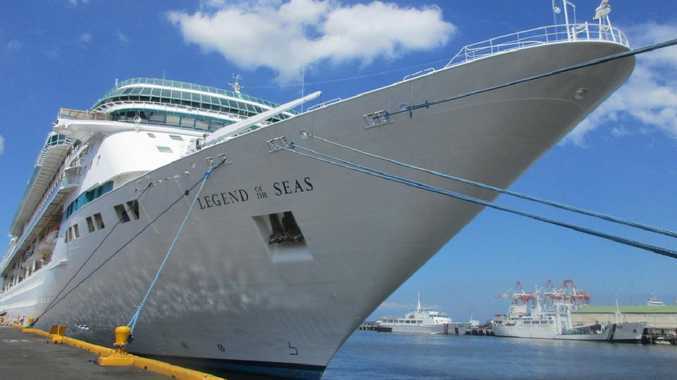 Louis Bignoux was on board Royal Caribbean’s ‘Legend of the Seas’ cruise ship when a 20kg bucket of tools dropped on his head. Picture: Brad Crouch. It sounds like a nightmare. And for 70-year-old Louis Bignoux hoping to celebrate his 45th wedding anniversary with his wife Sallyanne, that's exactly what a dream cruise turned in to. 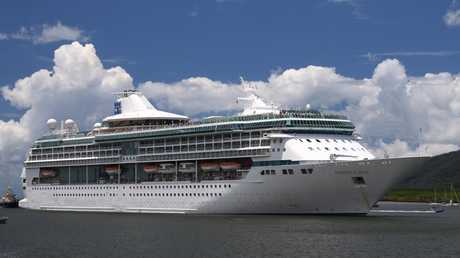 Mr and Mrs Bignoux, from Ipswich in Queensland, set sail on the Royal Caribbean Cruises 'Legend of the Seas' voyage from Brisbane to Vanuatu, Loyalty Island and New Caledonia on 26 February 2016. It was on board one of their favourite ships, which they'd travelled on previously and loved the experience. 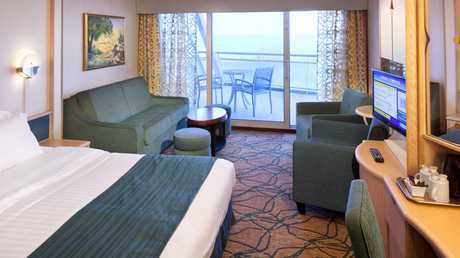 "We've cruised many times before with Royal Caribbean, P & O and Princess Cruises," Mrs Bignoux said. "But we liked the 'Legend of the Seas' so much, we decided to book it again for our anniversary." 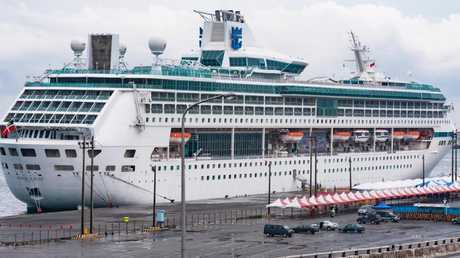 The Royal Caribbean Cruises ‘Legend of the Seas’ was in port in Noumea when the horror incident occurred. But on the final few days of the cruise as the ship was in port in Noumea before continuing on to Brisbane, they claim the unthinkable happened. "It was about 8.30am in the morning, and people were getting ready to get off the ship in Noumea," Mrs Bignoux explained. "We don't normally get off at Noumea as we don't like it very much. It was a bit hot that morning, and we weren't sure what we would do for the day. We decided to go up on Deck 4 near the pool area with seating. "I was standing against a rail having a smoke, and Louis went and sat in a deck chair to have a lie down." As Ms Bignoux gazed out to the port, she noticed a maintenance worker make his way across the deck with a white bucket full of tools including hammers, spanners and screwdrivers. As the crew member made his way up the ladder to conduct maintenance, they claim the unthinkable happened. Louis was relaxing on a deckchair when a 20kg tool bucket was allegedly dropped from a height and on to his head and chest area. Picture: Ric Frearson. "The ladder was next to the deck chair Louis was laying on," Ms Bignoux said. "There was a safety plate with a lock in front of the ladder so no one could climb it unless you had a key. "But after he started climbing, the next thing I heard was Louis screaming in pain and holding his head and his chest. He didn't look like he was with it all." 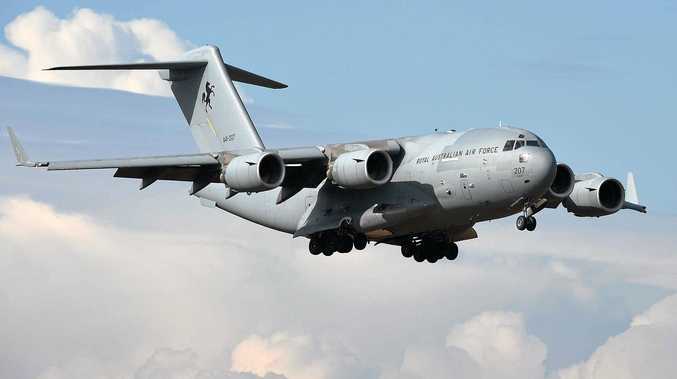 The couple claim that as Mr Bignoux rested, oblivious to the maintenance work going on around him, the crew member accidentally dropped his 20 kilogram bucket of tools from the ladder which landed straight on Mr Bignoux's head, neck and chest area. "I don't know if the worker lost his footing or what," Mr Bignoux explained of the incident. 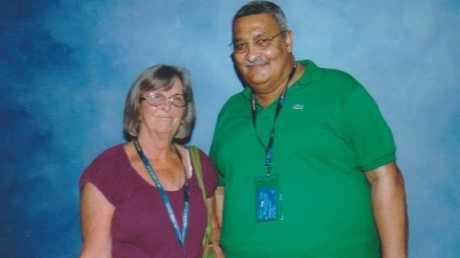 Sallyanne and her husband Louis Bignoux were on board the Royal Caribbean 'Legend of the Seas' in 2018 for their 45th wedding anniversary. "The bucket had come through a 2 metre gap above me … crashing down on to my head," Mr Bignoux claims. "There were tools and spanners everywhere." Mrs Bignoux rushed over to her injured husband, who she said "looked like he was going to pass out". "There were two ladies in the deck chair near Louis, and they ran inside to get someone to help us," she explained. "A doctor was called to the deck and a lot of official looking men in uniform followed. They got Louis a wheelchair and took him to the sick bay. The crew member on the ladder who had been doing the maintenance kept screaming 'oh my god, oh my god,'" he claims. Mrs Bignoux, from Ipswich, said Royal Caribbean cruise staff went above and beyond to help Louis after the accident. Picture: Stewart McLean. Mrs Bignoux said in the days following the accident, staff on board the vessel went above and beyond to ensure Louis was taken care of. "Everyone was very worried about Louis," she explained. "He started to show severe bruising and developed a throbbing headache after the fall, and the medical staff kept in touch the whole time until we docked in Brisbane. "When we arrived home, they arranged for him to be in Royal Brisbane Hospital for a CAT scan, which didn't reveal any fractures or breaks. 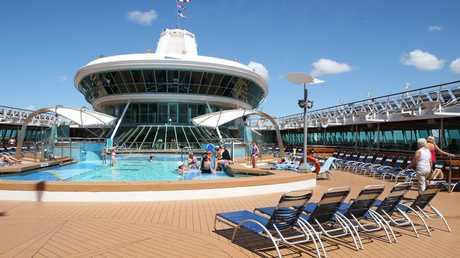 "Staff at Royal Caribbean called every week to see how he was improving, so in that respect they did carry out a duty of care. The treatment on the ship was excellent and no one could've been more worried about him than what they were." 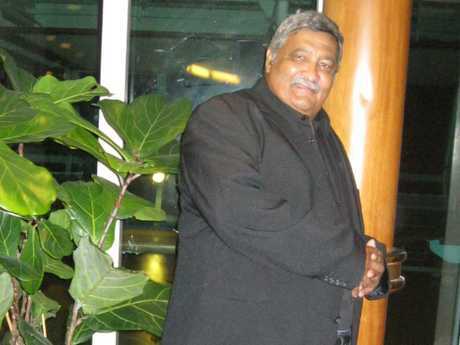 Louis Bignoux suffered serious injury while on a cruise ship in 2018. But Mr and Mrs Bignoux, who are being represented by Shine Lawyers, say there has been no explanation as to why the deckchairs would be positioned in this area in the first place, or why there was nothing in place to stop an incident like this occurring during routine maintenance. "Every other cruise ship would have roped off an area for maintenance," Mrs Bignoux said. "If someone is painting or tightening a bolt, there's always an area roped off. "But the man going up the ladder would've seen Louis on the deckchair, but at no time was he asked to move. It could've been so much worse. "If he was a frail old lady or man or a baby, they would've been killed." Mr Bignoux said after going back to his room after the accident, medical staff on board continuously checked on his condition. Shine Lawyers commenced proceedings in the New South Wales Federal Court of Australia in August 2018, alleging that Royal Caribbean failed to provide reasonable care for passenger safety when conducting maintenance work on board the vessel; failed to take steps to protect their passengers from obvious and foreseeable risks on board the vessel; and is in breach of the Australian Consumer Law. "We are really seeing a rise in claims like this and, frankly, we are horrified by the lack of regard that companies like Royal Caribbean have for the safety of their passengers on board their cruises," Shine Lawyers solicitor Sean Sweeney said in a statement to news.com.au. "Passengers should not need to worry about things like this occurring while they are on holidays and if cruise lines fail to ensure that the safety procedures and standards that they have adopted are effective in keeping their passenger safe, then it is important that they be held to account." When contacted by news.com.au, a spokesperson for Royal Caribbean said they were unable to comment on pending litigation, however insist they "operate all our ships safely, professionally and responsibly." Since the incident occurred, Mr Bignoux has been diagnosed with post-traumatic stress disorder, along with associated anxiety and depression following the incident. He is hoping to receive compensation for his pain and suffering, as well as his medical and pharmaceutical expenses. "I still don't really recall all of it happening, but I remember the bucket hitting me and then the pain," he explained. "This has impacted my life badly. In the middle of the night I will jump awake … and anywhere I go I feel I need to be more careful now, and I do get worried that something will fall on me. "In my eyes this was negligent … it should never have happened."